Experience one of the social and sporting highlights of the British summer with our Qatar Goodwood Festival corporate hospitality packages. This spectacular five days of horse racing action takes place in one of the most picturesque settings in the sport – Goodwood Racecourse. The Sussex Downs track is renowned for its undulating nature with horses needing supreme balance and speed to win any race at the Qatar Goodwood Festival. 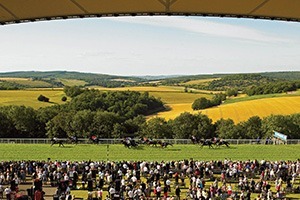 Also known as Glorious Goodwood the meeting combines the very finest elements of sport, fashion, style and corporate hospitality in a truly breath-taking setting. 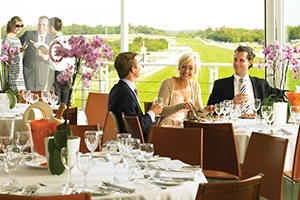 Entertaining your valued clients and guests with Qatar Goodwood Festival corporate hospitality packages will really provide the wow factor and is sure to impress. Don’t miss out on this fantastic event in 2019. 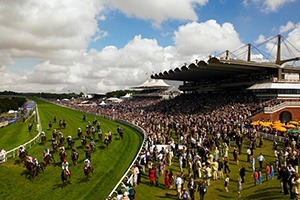 Tuesday 30th July 2019 The opening day of the Qatar Goodwood Festival kicks-off one of the finest sporting and social events of the British summer. 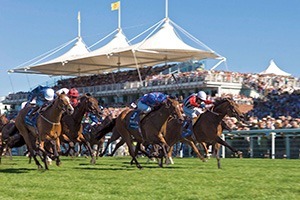 The iconic Goodwood Racecourse hosts two superb races on Glorious Tuesday with the Qatar Vintage Stakes and Qatar Lennox Stakes taking centre stage. Wednesday 31st July 2019 The second day of the Qatar Goodwood Festival is a spectacular sporting event featuring one of the biggest races in the UK - The Sussex Stakes. With a prize pot of over £1 million this outstanding Group One contest attracts the finest horses from around the world for 'The Duel on The Downs' . 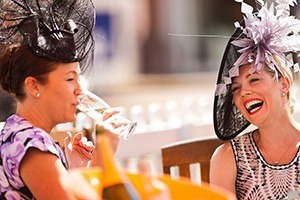 Thursday 1st August 2019 The third day of the Qatar Goodwood Festival is Ladies Day - one of the most stylish events of the summer. With the very best in fashion, style and horse racing combining for a truly fantastic day at Goodwood Racecourse. After the superb Magnolia Cup Charity Race guests can feast on three superb Group races. Friday 2nd August 2019 Day four of the Qatar Goodwood Festival offers guests the chance to experience the finest horse racing and hospitality as we head into the weekend. Friday of Glorious Goodwood features one of the quickest races of the entire season - The Qatar King George Stakes. Saturday 3rd August 2019 The final day of the Qatar Goodwood Festival attracts huge crowds for two of the biggest races of the flat season. The Group One Nassau Stakes attracts the finest fillies and mares for the £600,000 prize pot. While the Stewards Cup is one of the oldest and most valuable handicaps of the season. Located in the idyllic Sussex countryside, Goodwood Racecourse welcomes the world’s best horses and trainers for five days of fantastic action for the 2019 Qatar Goodwood Festival. Each of the five days of the Qatar Goodwood Festival features top-class Group racing and our corporate hospitality packages allow you to see them all in luxurious style with the finest food and service. The opening day of the Qatar Goodwood Festival, also known as Glorious Goodwood, sees the beginning of one of the most glamorous sporting and social events of the summer. Glorious Goodwood Tuesday features two superb Group races with the Qatar Vintage Stakes and Qatar Lennox Stakes taking centre stage. The second day of Glorious Goodwood features one of the world’s finest races – The Qatar Sussex Stakes. The Group One contest carries prize-money of £1 million; making it one of the richest races in the UK. The jewel in the crown for the Qatar Goodwood Festival this prestigious race has been won by some of the finest horses including Frankel (2011 & 2012). Run over one-mile it is a premier race with the match-ups often billed as ‘The Duel on the Downs’. In 2013 the race went the way of The Gurkha who levelled the scores at 1-1 with his rival Galileo Gold. The pair had previously met at Royal Ascot where 2000 Guineas winner Galileo Gold came out on top under a masterful ride from Frankie Dettori. The third day of the Qatar Goodwood Festival is Ladies Day. Glorious Goodwood Ladies Day is one of the highlights of the horse racing season combining the finest elements of style, elegance, fashion and sport at this iconic racecourse. The women truly take centre stage on this fantastic day with the ladies celebrity race, the Magnolia Cup, providing a vibrant and colourful start to the afternoon. The fourth day of the Qatar Goodwood Festival features one of the most exhilarating races of the entire flat season – The Qatar King George Stakes. Run at a electric pace over five-furlongs it features some of the finest sprinters from Britain and beyond. With the horse and riders reaching speeds of up to 40mph as they flash past the Glorious Goodwood crowds – this a real ‘blink and you’ll miss it’ event. The final day of Glorious Goodwood is highlighted by two of the biggest races of the summer. Firstly the Group One Nassau Stakes attracts the very best fillies and mares who compete on the Sussex Downs for a prize fund over £600,000. The other highlight race is the Qatar Stewards Cup, a valuable handicap prize which captures the imagination of all in attendance at the Qatar Goodwood Festival. Entertaining your guests with Qatar Goodwood Festival corporate hospitality packages will guarantee a truly unforgettable day of horse racing and luxury.